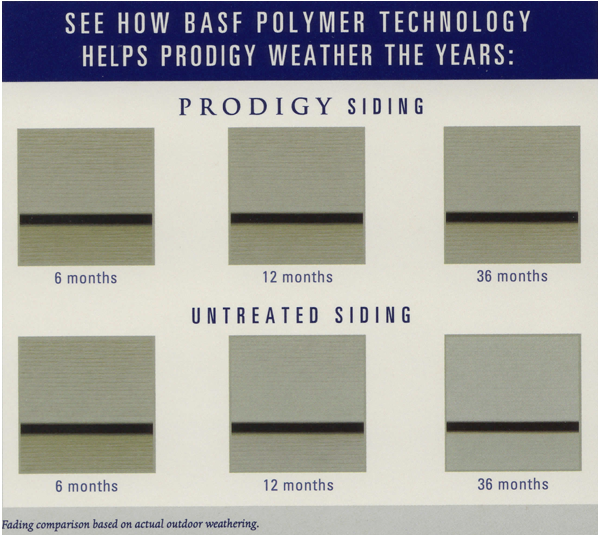 Prodigy® is the next generation of insulated siding. Superior insulation, superior engineering, superior sense of style and refinement. It is a siding system without compromises. 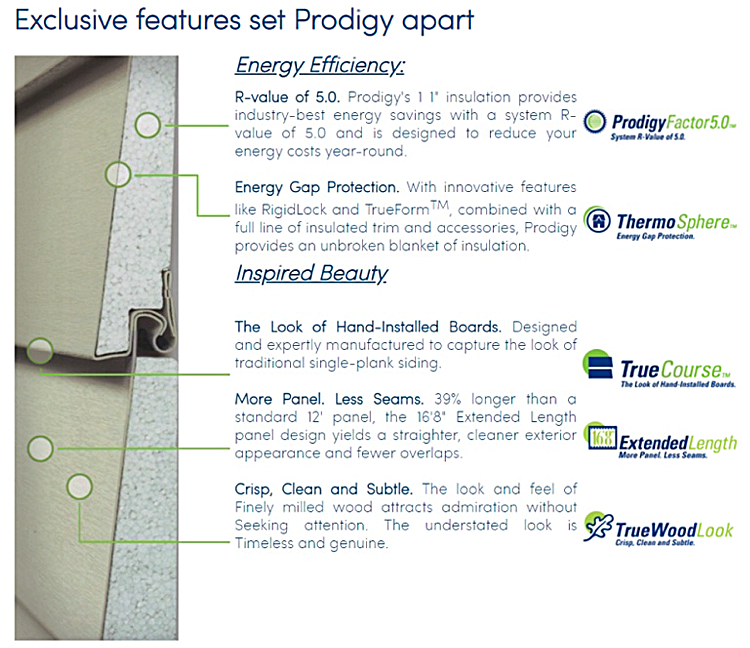 Prodigy provides unsurpassed energy savings,true maintenance freedom, durability and an aesthetic sensibility that speaks to the visionary in us all. Luran® S ASA copolymer compound from BASF acts as a strong exterior layer of protection. Applied to select Prodigy colors, Luran S provides unparalleled protection from fading in the sun and wear from harsh elements. It also helps Prodigy resist dings, abrasions and chemicals. You can show off rich deep colors with the confidence that comes with BASF polymer technology. 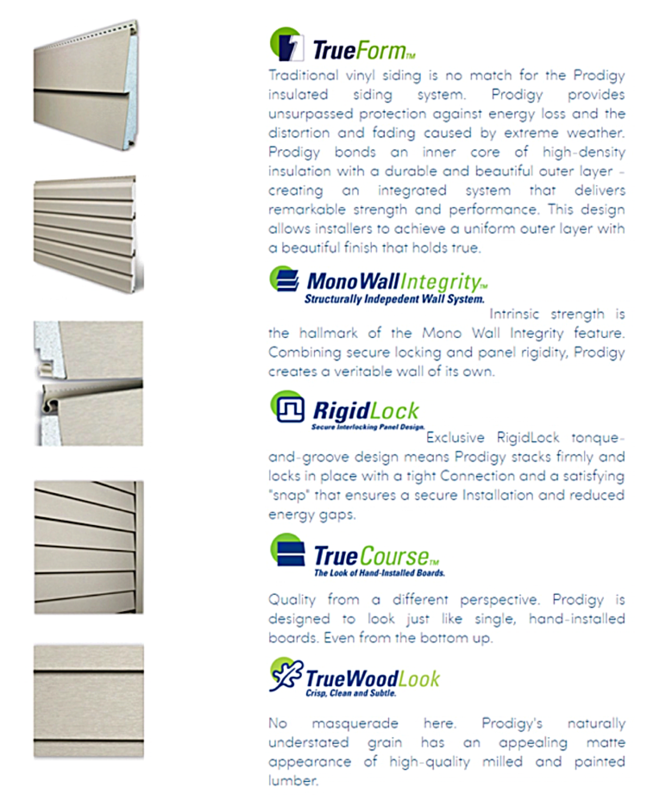 Prodigy has peace of mind built right in, proudly offering the strongest warranty in the industry. 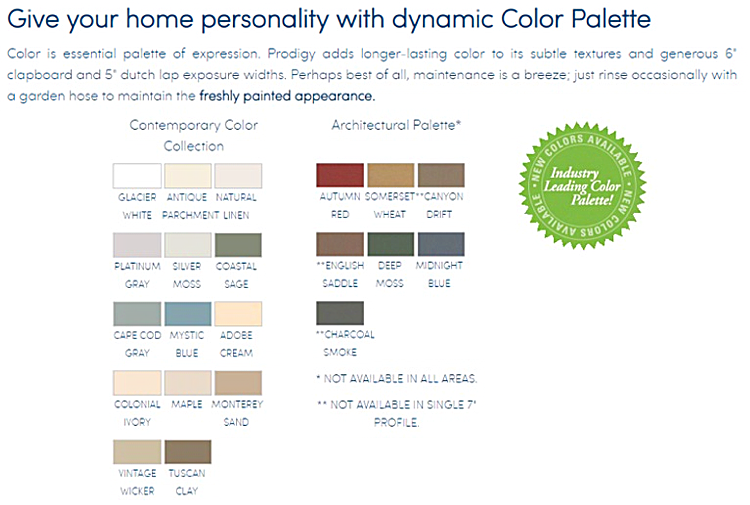 Prodigy siding is backed by lifetime limited warranty including an industry leading fade warranty. 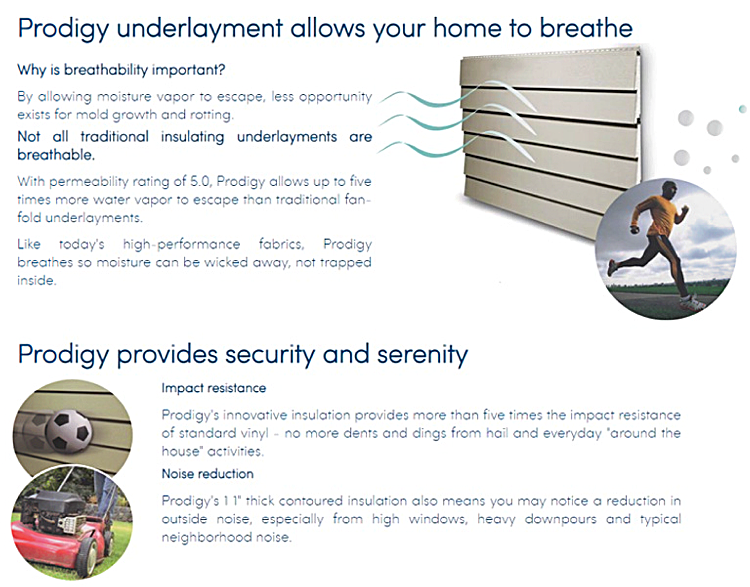 Click here to view Prodigy’s warranty. This video explains the benefits of our quality vinyl siding. Watch this video to see how durable our siding is. We innovate. You benefit. From the first day it hit the market in 1969, right up until today, CertainTeed Vinyl Siding has been a game changer. The introduction of a highly engineered alternative to wood siding opened the door to new opportunities for homeowners. As the demand for greater product performance grew over the years, so did our commitment to continuous innovation. 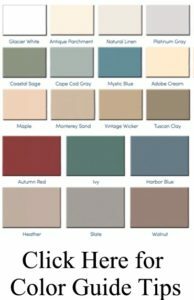 Today, vinyl siding is the number one siding choice in the United States.1 CertainTeed makes vinyl siding to accentuate many home styles and colors. But its beauty is more than skin deep. Traits like durability, low installed costs, ease-of-maintenance and manufacturing sustainability combine to make CertainTeed Vinyl Siding one of the smartest investments money can buy.